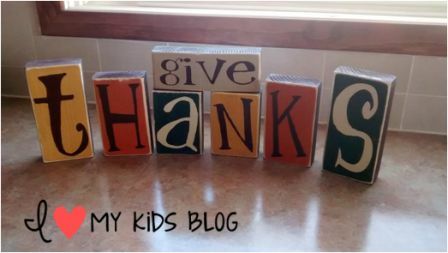 Reversible Holiday Blocks make decorating easy and fun! I’m the kind of gal that doesn’t do a whole lot of holiday decorating due to the amount of effort required, so when I do, it has to be easy to do. That is why I fell in love with these reversible holiday blocks from Pearlized because they simplify my holiday decorating! One side says Give Thanks then I flip them over and the other side says Jingle Bells. How cute, right? You may remember my previous post about Pearlized. 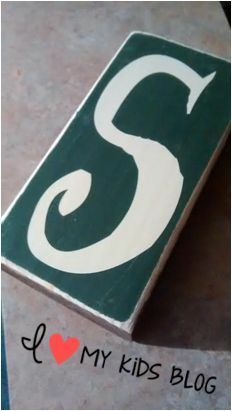 They offer birthday boards, kits of all kinds, and other fun wood crafts! This awesome set of reversible holiday decorating blocks have to be one of my new favorites from the Pearlized Etsy shop! Each set includes 7 blocks. 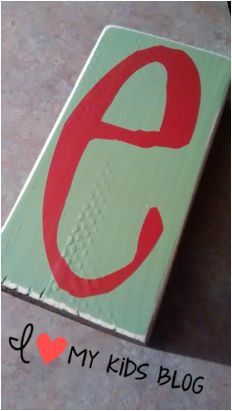 The blocks themselves are painted and the letters are vinyl. One thing I love about these blocks is every side is painted, so it looks great from any direction. Even the top and the bottom are painted! 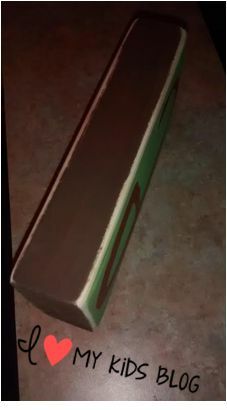 Each block also feature the natural wood showing around the edges. This is a nice added touch. 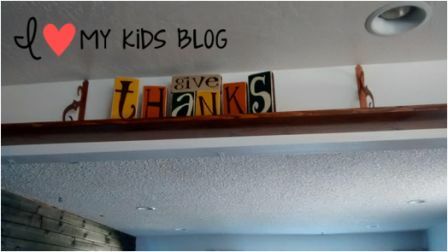 One side of the block is painted a coordinating color for the phrase Give Thanks. 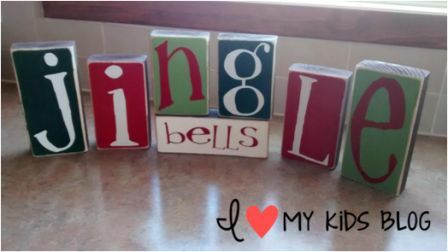 The other side is painted a coordinating color for the phrase Jingle Bells. As soon as I got the package I opened it up and set it up for the Thanksgiving side. With a simple flip of the holiday decorating blocks it then spelled out the Christmas side! I even have the perfect place to put them! We recently moved into a new home and have these fabulous “display shelves” lining the kitchen. We’ve lived here for 2 months and I haven’t put a single decorating item up yet! I thought this was a perfect and easy start! I have some space on the shelf beside the decorating blocks, so I thought when Jingle Bells season is over, I may switch it back to Give Thanks and put our children’s pictures up there next to them. It can be year round decor! These reversible holiday blocks are only $25 on the Pearlized Etsy shop! I think this is an awesome price for the quality of work provided! You can use coupon code ‘PEARL5’ to receive 10% off your purchase of $20 or more. Giveaway for reversible holiday decorating blocks! Pearlized has offered to give away one set of these reversible blocks to one of our readers! Who wants them? Entry is pretty easy, just by entering on the rafflecopter form below! This giveaway is open to US residents and will end on October 10th at 11:59 pm EST. Winner will be notified via email and have 24 hours to claim prize or a new winner will be drawn. GOOD LUCK! CONGRATS to our winner: Gerry Davison! Congrats Gerry, please check your email, you have 24 hours to reply to it or a new winner will be chosen! Thanks to all who entered! The nice lady at Pearlized has a coupon code for our readers! Use coupon code ‘PEARL5’ to receive 10% off your purchase of $20 or more! 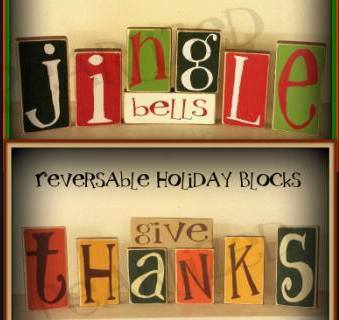 These reversible holiday blocks would be an even better deal than the price listed above! Disclosure: I received the reversible blocks mentioned above so I could form an opinion to share with you. Regardless of our arrangement I was not required to give a positve review. I really do like these blocks! Really think these are cute. I think the m&m birthday board is adorable. Would love it for a classroom. I love the family established signs and tiles! I also really like the Birthday Board in Country Theme. Cute idea for keeping track of birthdays in the family. I like the Halloween Subway Art. Denita’s so crafty! I think her birthday boards are both practical and decorative…they’ve been in my Etsy favorites since I first saw them last month. I like the Birthday board country theme Delightful font. I love all the designs , my favorite is family established designs! I like the Halloween Subway Art. And of course I submitted too early. 😉 I really love the birthday boards! ha ha! That happens to me all the time! Really love the reversible blocks! But, the family birthday board in black and white is nice too. I like the family birthday board. I love the Family Birthday Board. Would make keeping up with birthdays easier. The Family Birthday boards are another thing I like. The M&M colors/theme one is the one Iblime the best. I like the family birthday boards. I like the Happy Halloween clings. I like the family birthday board, country theme. I went to Pearl’s shop and I LOVE the family birthday board! Went to pearlized and loved the family calendar of who had what month for birthdays. Really cute! Must go buy if I don’t win!!! I really LOVE the family birthday boards!!! Perfect for when you have a very large extended family! I like the Family Established signs! I absolutely love the black family birthday board!! i love the Birthday board never forget! really good idea since i always forget. I like the black and white family birthday sign, that is a really neat idea. I like the birthday kit signs. That’s a fun way to remember everyone’s birthday. I love they reversible blocks. I love the birthday board. I like the birthday calander!! Its such a great idea!! I liked the reversible blocks best. I like that they are great for two holidays and they have my initials, KLJ, in there too as an added bonus for me!!! These are super cute! They look easy to make and may be a contender for my next craft day! I love the “Be nice because it matters.” plaque. Honestly, I love everything, but I think my favorite is the Family Birthday Plaque. Ooh, I love the Family Birthdays in the Country Theme! I’ve always wanted one of those. I also love the orange Give Thanks board with the pumpkin. I like the Halloween Subway art. Very cool! I love the birthday boards! Love this sweepstakes. Also love the calendar with the birthdays. I love the family birthday ones. I can never remember all my extended families birthday and this is such a cute way to remind myself. These reversible blocks are my favorite! I have the prefect place for them on my mantle! The “Be NIce Because It Matters” sign. I like the established 12×12 name tile! I like the Established Board – Plaque for our family name. The horizontal format works because we have a long name. This is really cute! I love her family birthday signs! I need one of those, I can never keep track anymore, lol, plus they look really cute ? I like the family name/established sign. Reasonably priced too. I love the 12×12 Tile with Easel with the Family name. Would be PERFECT on our entry way table! Thanks. I LOVED the family birthday boards, how great are those. Just a great idea!! I love the birthday boards. The birthday boards are super adorable! Great giveaway. If I win I’m giving them to my mom. I like the Halloween subway tiles. I like the colorful family birthday calendar! I looked at Pearlized’s Etsy store, and I really like the black and red colored family birthday sign! I really really like the family birthday boards in her shop. So cute! The country theme birthday board is tooo cute!!! I think the Perfect Marriage plaque and the Give Thanks plaque is quite adorable!